For the past several years, Canon has rewards its consumers with a Summer Rebate program. This year’s program is even better since the instant rebates apply at the point of purchase. It’s a great way to encourage sales when everyone is so careful about spending! I have written about B&H Photo in NYC before. They are a price leader for photographic equipment across most brands. Usually my experiences have been favorable, but Fourth of July Weekend was a different story. I called Canon’s US Corporate Office to try to confirm the price increase. The rep was not aware of a price increase, but would check on it. As of today, I have not heard back from her. Hmmmm … something is not kosher here. But, for now, got to go to J&R not B&H! This has been discussed at length in numerous online forums for weeks now. As has been amply demonstrated elsewhere, market conditions beyond our control forced several legitimate retailers to raise prices on SOME but not all rebated lenses and on SOME but not all non-rebated lenses. 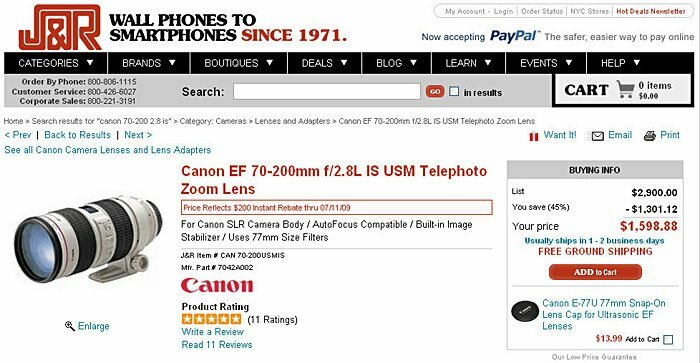 B&H has never claimed this was due to a Canon USA price hike, although Canon USA did hike prices at the start of an earlier rebate program a couple of years ago. Our catalogs and magazine ads all state, “Prices contained herein are valid at the time of publication and are subject to change without notice.” Certainly in these times of ever fluctuating prices and other unpredictable market conditions, the disclaimer is reasonable. In closing, we’re sorry for your discontent, but we certainly do not deserve your “non kosher” headline. 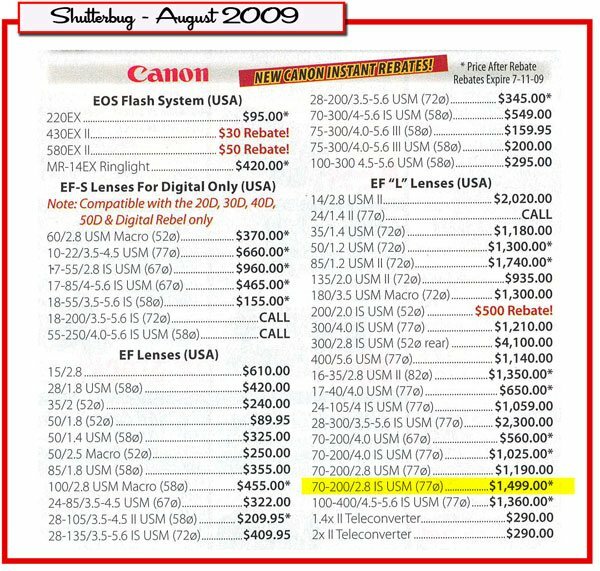 TWO different people (your sales clerk AND Eli the Floor Manager) called your buyer and was told the same thing – that Canon raised the price and you were passing the increase along. You need to have a discussion with your buyer. Why does J&R still have a lower price? Why does Cameta Camera still have a lower price?? I guess they value their customers more than B&H. It seems like you are eating the instant rebate to make a little extra profit. THAT is not Kosher! Valuing our customers doesn’t mean having the lowest prices. Valuing our customers means honesty, ethical integrity, accessibility, knowledgeable sales associates, speedy shipping, keeping merchandise in stock, not compensating for artificially low product prices with inflated s&h and so on. What about honoring your own published prices? You can not claim “typos” is ALL of those magazines (and even your own catalog). Those ads bring traffic into your store. THAT is valuing customers who respond. Such discrepancies deserve to be pointed out to the general public! Otherwise, you are no different than Broadway Photo and other bait-n-switch retailers. These rebates went into effect May 3, 2009 and this has been a topic of discussion ever since in several well-regarded forums. For all your vociferous enthusiasm for the topic, this is a little bit of now-old news. As I said elsewhere, we regret your dissatisfaction. I’m not sure there’s anything more to add to this tired debate. 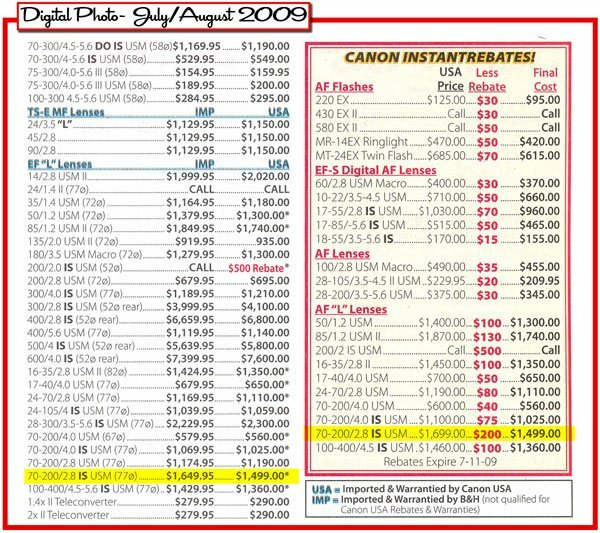 All of you ads are labeled with “Canon Instant Rebates” which clearly indicates the existent of the rebates and that your prices have been adjusted accordingly. The ads are even dated with expiration dates. If the prices were not “typos” and you acknowledge that they are not correct, then they are intentionally misleading. The ads have been published in several magazines for months and should have been corrected when your company knew they were no longer accurate. One month is forgivable, three months is intentionally misleading to generate traffic! And, as for Macy’s, they would and do honor their own ads … even when they are at fault. Otherwise, they publish a retraction stating the error. Since this has been going on for months and discussed in such “well-regarded forums”, where is B&H’s retraction and public statement addressing the error?? But, none of this excuses the statements from your buyer relayed through two different B&H employees. Canon was not to blame. 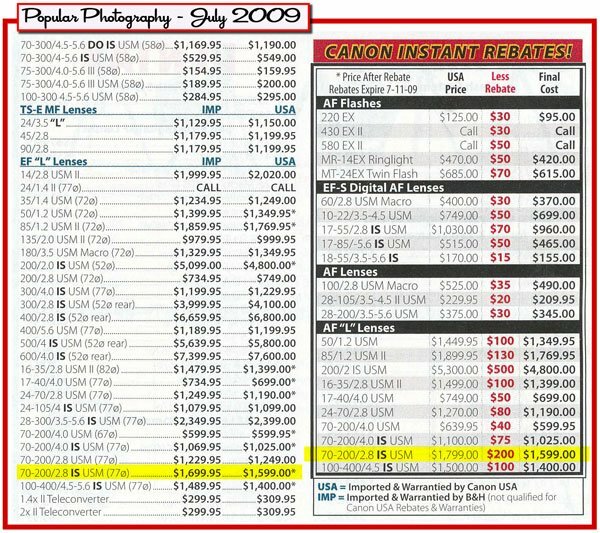 Canon did not raise your prices. 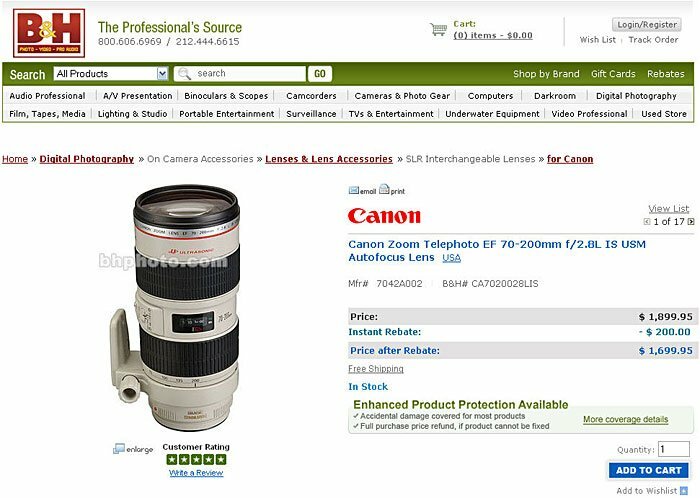 B&H decided to raise its prices and NOT to honor its printed ads and continue using those misleading ads to generate traffic! Our prices were not typos when the ad content was generated and laid out. There’s some lead time between then and when the ad lands in your mailbox during which things change, hence the disclaimer, which is similar to disclaimers used by almost every responsible retailer one can name. There’s nothing misleading about this, despite your misplaced insistence otherwise. You seem to embrace seeing conspiracies in a coincidence. I pass Macy’s NYC store daily. From time to time one will see a notice posted on their door regarding an error in an ad or flyer. They apologize and explain the ad price will not be honored. They do so politely and professionally, just as they should and just as B&H does. B&H continues to use the ads because there’s no way to recall them once they’ve been printed and mailed. The ad you’re exclaiming about today was created months ago. Asa I said, I’m not sure there’s anything more to add to this tired debate. I understand the lead time in print ads for magazines. As I wrote, one month is forgivable, several month’s is intentionally misleading. Where is B&H’s retraction regarding the misleading price??? There was nothing posted in the store or on your website and there were no flyers being handed out ala Macy’s. There was no insert in the stacks of B&H Summer Catalogs which also have the misleading price. What’s your excuse for that? From http://www.jr.com/: Online prices, selection, descriptions, specifications and images generally match our retail stores, but may vary and are subject to change without notice. Not all accessories pictured are included. Manufacturer rebates, terms, conditions and expiration dates are subject to manufacturers forms. Not responsible for typographical errors. The only J&R ads I’m aware of are the daily ads published in the NY Times. There’s a significant difference between a daily ad and a quarterly journal. http://www.abesofmaine.com/support.do says: We endeavor to publish accurate selling prices for the products we offer. However on occasion we do make mistakes. In the event a product is listed at an incorrect price or with incorrect information due to typographical error or error in pricing or product information received from our suppliers, AbesofMaine.com shall have the right to refuse or cancel any orders placed for products listed at the incorrect price. AbesOfMaine.com shall have the right to refuse or cancel any such orders whether or not the order has been confirmed and your credit card charged…Prices are subject to change…We will notify you if we are unable to accommodate your order. Abe’s of Maine may, at its own discretion, limit or cancel quantities purchased per person, per household or per order. http://www.beachcamera.com/: Prices are subject to change at any time without notice based on a combination of factors that are generally out of our control. They are usually dictated by market and availability conditions and/or by the manufacturers themselves and are often as likely to increase as they are to decrease…Pricing Error: Despite our best efforts to advertise prices appropriately, some items may be advertised incorrectly due to a typographical error. We reserve the right to refuse or cancel an order for an item that was priced incorrectly, whether it has been confirmed, charged, and even shipped. If an order is refused after it was shipped due to a pricing error, we may issue a charge to reconcile the price difference. The pricing posted on our website may not always be identical to those found on some price comparison shopping websites. http://www.adorama.com/: This web site is intended to be a guide only. Some items illustrated are for display purposes only, and are not necessarily included in the purchase price. Specifications may change without notice. All items offered for sale are subject to availability. Many items in this catalog and web site come from various sources. Adorama is, therefore, bound to fluctuating currency exchange rates, making it necessary to occasionally increase prices. In addition some domestic and overseas products may be discontinued without our prior knowledge. Should this apply to your order, we will, at our discretion, either contact you for instructions before shipping or cancel your order and notify you of such cancellation. We reaffirm our pledge to offer excellent service and the highest quality at the lowest price. Yes, even Broadway Photo has similar statements regarding typos and they are currently being investigated by the New York State Better Business Bureau. You have already acknowledged that this price in numerous ads and your catalog was not a typo. * What steps did B&H take to notify the public regarding this misleading price? * Where is B&H’s retraction regarding the misleading price??? There was nothing posted in the store nor on your website. * Where were the corrective flyers being handed out ala Macy’s (a policy that you seemed to like)? * Where is the insert for the stacks of B&H Summer Catalogs which are still in your store and contain the misleading price? * Why did B&H not take steps to correct these ads in future publications once they were aware of the price change? * Why did B&H continue to run these same ads after they were aware of the price change? F**K YAHZ!!!! SUM THING IS WR0NG WITH THEM @ B&H! Seriously, tl;dr. How do we know you’re not some guy in the employ of J and R anyway?